Foam Rolling. Should I Be Doing It? Home Blog Foam Rolling. Should I Be Doing It? Short answer: yes, you should be foam rolling. Foam rolling has become a staple in gyms and homes for supplementing workouts, preventing and relieving soreness and pain, and maximizing the body in general. You may be thinking to yourself that foam rolling is just another way of stretching. If you stretch consistently before and after workouts, it may seem like something that is unnecessary for you to add to your regimen. What you may not know is that foam rolling and stretching are not the same. Foam rolling focuses on something called myofascial release, which is a concept used often by therapists, masseuses, and chiropractors to treat their clients. What is myofascial release? Myofascial release consists of applying gentle, sustained pressure into myofascial tissue to eradicate pain and restore movement. Fascia is a thin, elastic sort of connective tissue that surrounds, connects, and supports our muscles. This tissue can potentially become restricted do to overuse, trauma, injury, and other factors that lead to pain, muscle tension and decreased blood flow. By using myofascial release, stiff myofascial areas are given the aforementioned light pressure in order to relax the muscle and reduce internal “rubbing” between muscle and fascia, which then can increase blood flow, movement, and flexibility to the area as a whole. So we somewhat listed benefits above, but with a bit of scientific jargon that may have put you to sleep for a bit. That being said, let’s look at the benefits from foam rolling. Increased Blood Flow: Blood is obviously of vital importance, as it carries oxygen and glycogen to sore and fatigued muscles. When foam rolling, you are applying steady force to the muscle you are rolling slowly and methodically, which compresses the blood in the connective tissue and muscle out, replacing it with new fresh blood. Increased Movement: With increased blood flow and relaxed muscles, muscles and fascia work together more efficiently by interacting with less friction. Movements are smoother and muscles are less likely to pull. Foam rolling before a workout or run is a great way to effectively implement this benefit. Injury Prevention: When blood flow and movement are increased to the muscles, as well as reduced friction amongst muscles, the risk of injury is significantly decreased. Performing this self-myofascial release before and after exercising can help you stay injury-free. Reduced Soreness: Foam rolling can reduce both the severity and the length of soreness in the muscles. A 2015 study by the National Athletic Trainer’s Association concluded that foam rolling effectively reduced delayed-onset muscle soreness (DOMS) in most performance measures. How many times have you skipped a workout because you were too sore from a workout one or two days before? Foam rolling decreases soreness and helps you stay on schedule. Decreased Recovery Time: As alluded to in the paragraph before, the benefits of foam rolling all lead to decreased recovery time. If you’re like me, you’re working out or participating in sports essentially every day. If my quads are still shot from squats, it’s going to hurt my mobility for my weekly basketball league. Foam rolling is a great way for me to ensure that I’m ready to go each workout or game. Faster/Better Results: With increased, blood flow, increased movement, less injuries, less soreness, and quicker recovery time, you’re going to naturally get better results, and you’re going to see these results faster. What may have been achievable in 6 months may go down to 5 due to being able to stay on schedule and approach each workout with your muscles feeling fresh. Now, once you’ve committed to giving foam rolling a try, there are some staple exercises that you should go for. First, it is important to note that these should not be quick movements, but slow and methodical. The key is a sustained pressure, so if you roll back and forth to quickly you’re not going to get the same benefits. You want to slowly squeeze out all of the tension in the fascia and muscles. Think of the image of a steam roller slowly moving over and smoothing out its terrain. Now that we have that settled, I’ll briefly sum up each of the standard movements you can do when foam rolling. Lie down on your back and place the foam roller underneath your upper back. Lift your hips to put the weight onto the foam roller. Slowly move so that the foam roller positions from your upper to mid back. The lower back is done much like the upper back movement, but with some subtle differences. Putting the foam roller under the lower back will naturally lift the hips up and put immediate pressure on the lower back. Our lower backs are generally not as strong as our upper backs, so it may be overly strenuous to be in this position. Now when you roll, be sure to position yourself slightly leaning to one side at a time. This takes the pressure off of the spine and puts it onto the muscles. Repeat on the other side when finished. Put your hands to the side or back for stability. Try to keep most of the pressure on the back, but use the stabilizers to relieve discomfort if there is too much pressure. Sit on the floor and place the foam roller underneath your hamstrings. Place your hands onto the ground behind you for support. 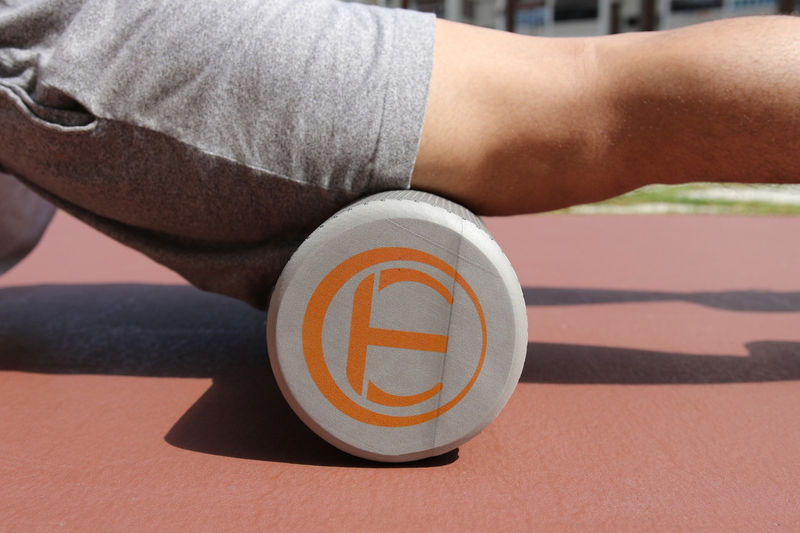 Lift your hips off of the ground and roll your hamstrings back and forth over the foam roller. You can do this with both hamstrings simultaneously, or you can shift the weight onto one leg at a time. Generally the latter is preferred, as you can really focus on each leg muscle separately. Lie face down on the ground and position the foam roller underneath one leg. Make sure that leg’s foot is off the ground, and as much weight as possible is shifted onto that leg. Roll your quads over the foam roller from the knee to the groin area, encompassing all of the quad in a slow movement. Sit on the floor and position the foam roller underneath your calf muscles. This can be done with one or both calves at a time. Put your hands behind to support the weight, but keep the majority of the weight on the roller. Shift your weight over the roller from below the knee to above the ankle, slowly working over all of the calf muscle. Lie face down in a planking position, and position the foam roller under your groin and parallel to your body. Relax the inner thigh and groin muscles, and put as much weight as is tolerable on the roller. Slowly roll from your inner to outer thigh. Repeat on the opposite leg. Lie on your side and position the foam roller underneath the outside of your leg under your hip. Cross your inactive leg over the active leg and place your opposite hand on the ground in front of you.. Put as much weight on the bottom leg as possible, using your hand and elbow to relieve pressure if the pressure is too much. Roll your leg over the foam roller from hip to above the knee. Lay down on your stomach and position the foam roller underneath your shins. Put your elbows/forearms on the floor in plank position, lifting off of your stomach/knees and putting the rest of your weight on your shins. Slowly roll your shins over the foam roller back and forth. As I’ve mentioned a couple times earlier in this article, foam rolling before and after a workout is extremely beneficial. However, because foam rolling is a slow and methodical process, you don’t have to go through the entire list of exercises above before each workout. If you know you’re going to be doing legs, utilize the leg exercises described above. If you’re lifting back, do the back exercises. Other than before and after workouts, I like to foam roll at home as often as I can. If I’m going to be watching television for a while, I’ll foam roll for a bit while I watch. You’ll be getting the benefits of foam rolling while enjoying your program, and avoid sitting for too long as well, which is never great for the body. For every half hour of television spent sitting, maybe challenge yourself to do 5-10 minutes of rolling out a couple muscle groups. Where Can I Get a Foam Roller? Foam rollers have greatly increased in popularity and can surely be found nearby. Any sporting goods store will definitely have a broad range of foam rollers. You can find basic foam rollers of varying sizes, as well as more expensive foam rollers that may have different textures or padding variations. Your choice of foam roller is completely up to your personal preference. If you can, try a few out and see what feels right and is in the price range you’re willing to spend. They even make some now that vibrate for “optimal muscle relaxation.” I think that’s a bit excessive but to each their own. For me, I like to keep it simple. I have a basic foam roller that is only 18 inches long. I find that when I’m doing one-legged rolling, the long ones (they can go up to 40+ inches in length) tend to just get in the way and make it more awkward to roll. I think mine was between 15-20 dollars, and has been worth every penny. The benefits are all there and ready to be found. Foam rolling is proven to increase blood flow and mobility, reduce soreness, and decrease the likelihood of injury. All of those benefits means you’re going to find your desired results faster and have a body that is ready to participate in exercise or athletics whenever it is called upon. So get rolling, and maximize the effectiveness of your body.